My kids are pretty picky eaters and getting them to eat vegetables can be a real challenge. I often just feed them raw vegetables before we even sit down at the dinner table because that way they like them. I thought, why not incorporate the raw vegetables into dinner and make everyone happy? I used their favourite raw veggies which are cherry tomatoes, red peppers and carrots and it was a success! Boil the oven potatoes for about 20 minutes. Prick the skin, brush them with olive oil and sprinkle with some sea salt. Then put them in the oven at 200°C for about 35 to 40 minutes. You can also pre-soften them in the microwave in a base of water. The amount of time will depend on the number of potatoes. For two potatoes 5 minutes should be sufficient. 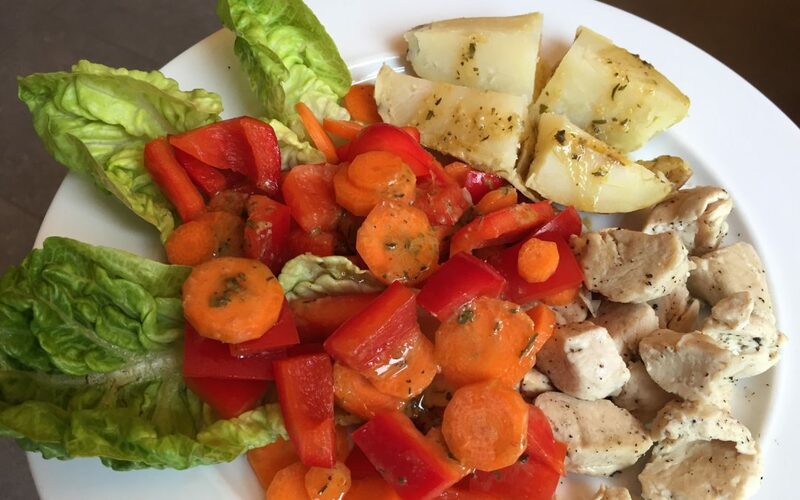 While your potatoes are boiling, cut the vegetables into bite size pieces and cut the chicken or turkey into cubes. By cutting your meat into smaller pieces, you can fry it quickly and without risking that it will burn on the outside while not being done in the middle. The other advantage is that your herbs and spices will coat more surface area. When your potatoes are in the oven you have a good half our to put your kids in the bath or play a game with them. Just before your potatoes are done (the first time you make this, you may want to wait until they are really done, then note down the time they needed exactly, turn off the oven and keep them warm) heat some coconut oil and fry the chicken cubes until they are slightly browned on all sides. Add freshly ground black pepper and some herb or sea salt (and additional spices if everyone likes them). Arrange a few leaves of the lettuce hearts on the plates, spoon over the cut up vegetables and arrange the meat and half a potato next to it. Sprinkle the vegetables including the potato with salad dressing et voilà, you have a nice, balanced meal that the entire family will love. My kids had three servings of the vegetables! Any left-overs can be eaten cold and make a good portable lunch for office or school. Cooked potatoes left to cool and eaten cold are an excellent source of resistant starch which is a super hero among the carbohydrates. Resistant starch is a kind of starch that is not digested in the small intestine. Because it “resists” digestion, it doesn’t spike blood sugar or insulin. At the same time it makes perfect food for the good bacteria in our gut. So it optimizes gut flora and promotes weight loss by improving your metabolism and keeping you feeling full longer. Write down the ingredients for this recipe on your shopping list now, so when you go shopping next you already have one meal planned. Don’t forget to bookmark the recipe or print it out so when you cook you don’t only have all the ingredients in the house but also have the instructions handy.